There are 2 Recycle Bins widgets inside the zip file for you to chose, a small and a bigger one. 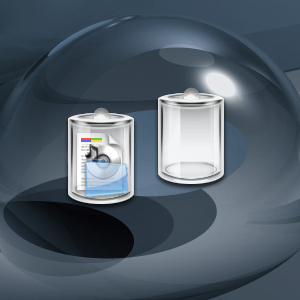 Another part of the Glassy-transparent widgets suite. thanks adni and brncofan7 but i don't have the IconX tab in my DesktopX settings. Just "welcome, theme, widgets, preferences and about" tabs. Maybe because I just have the free version? DoggNova , I guess it is the free version... I am sorry. Outstanding widget! No problems here. Any chance of a matching "My Computer" and "My Documents"?????? Ok, like, I just purchased desktopX and I still can't figure out how to hide the trash bin. to not display the recycle bin within it's configuration window/options. These are so nice, I don't want to throw anything away!!!! I really love these little recycle bins! and easy to use too.. Always on my desktop, ready to use. Never forget to take the trash out! Thanks! Just great for all my new themes. I've loaded the trash can, but I want to get rid of my default recycle bin. How do I do it? I'm having the same problem with trying to get rid of the old recycle bin. I read the above post regarding the option under DesktopX. Hey! What's that wallpaper you have displayed behind your widget? I've seen it before, but I can't find it now.